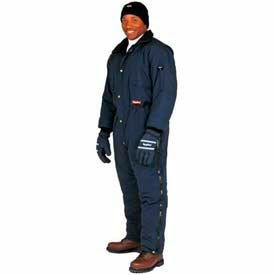 Refrigiwear Low Bib Overalls Are Used For Use In Industrial Freezers Or Extreme Outdoor Temperatures And Conditions. 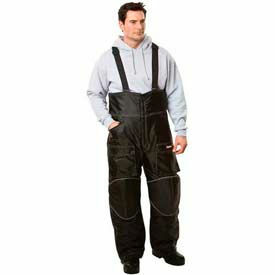 Refrigiwear Cold Weather High Bib Overalls Are Used For Extra Warmth In Cold Working Environments. 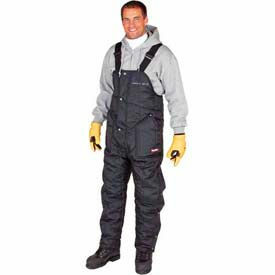 Refrigiwear Cold Weather High Bib Overalls are made of tear and abrasion resistant 420 denier nylon outer shell with 11.25oz high-loft polyester fiberfill insulation for maximum warmth and long lasting durability. High bib front and high back with adjustable heavy-duty 2" elastic suspenders and 3 insulated pockets. Available styles are Cold Activity-Snow, Extreme Cold-Snow, and Outdoors-Cold Snow. Comfort Ratings are -50°F, 0°F and 10°F Short, regular and tall dimensions range from S-5XL. Colors are Black, Navy and Sage. CE - Meets European Safety Standards. 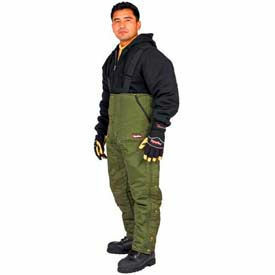 Refrigiwear Cold Weather Coveralls Are Used For Added Warmth In Extreme Outdoor Conditions. 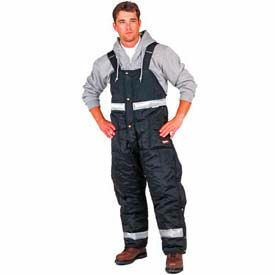 Refrigiwear Cold Weather Bib Overalls Are Used For Use In Industrial Freezers Or Extreme Outdoor Temperatures And Conditions. Refrigiwear Iron Tuff™ Enhanced Visibility Overalls Are Used For Use In Extreme Outdoor Temperatures Where Extra Visibility Is Required.